Dreamhouses seeks to evoke Jungian and universal concepts of dreams and the process of their interpretation. These sculptures, comprised of a row of identical houses and created for outdoor public spaces, provide a place for the head/mind to both inhabit and experience a dreamlike space. With the exception of color (red, blue, and yellow), each house shares an identical exterior form with metal roof, tall legs, and interior bench seats. In this installation, viewers sit on each of the bench seats, with their heads inside the respective house forms, to experience and participate in the interior space of Dreamhouses. Each house has its own “skylight” and interior space that suggests a different type of oneiric or dream-like space. 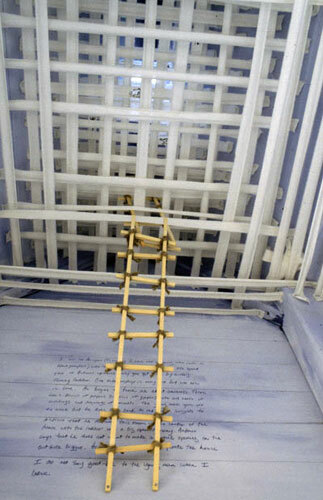 The interior of the blue house, with its cloud-like forms and ladder for climbing, is linked to the upper lofty space of our dreams, while the yellow house’s interior, a half-spherical, claustrophobic form, refers to the subterranean and earthy reaches of dream space. Finally, the red house has a spiral form in the interior, which symbolizes the free movement and energy of the subconscious in dream states.